Pingyao Gucheng (Ancient City) Railway Station is a newly built bullet train station which opened on July 1, 2014, and it is located in the southwest of Pingyao Town in Shanxi Province. It is excellent for travel east or west to Beijing or Xi&apos;an, and it also is for quick travel north south to Taiyuan or Datong. Travelers might consider this for trips from Beijing or along the Yellow River to Xi&apos;an and the Ancient City in Pingyao. 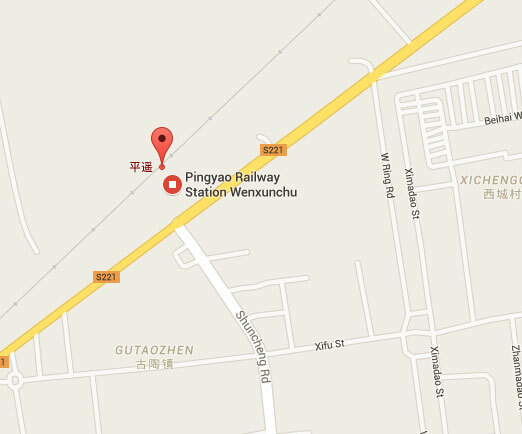 There is also a regular train station near it called Pingyao Railway Station. Travelers might get the two confused. Location: It is about 8 km (5 miles) from Pingyao Railway Station and 10 km (6 miles) from the Ancient City. Station size: 2 platforms and four station tracks. Street map of Pingyao Station&apos;s location. 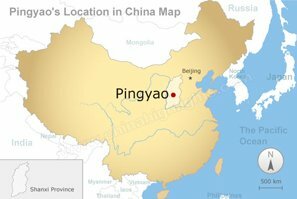 Lines and trains: Pingyao Gucheng Railway Station serves the Datong–Pingyao–Xi’an Passenger Railway and the Beijing–Pingyao High Speed Railway. It operates two G-trains to Beijing West and Yuncheng North daily, and D-trains to Taiyuan, Linfen, Xi’an, and Baoji. The segment of the line to Datong of the Datong to Xi&apos;an line hasn&apos;t been finished yet (as of 2016). When it does, it will allow for fast train travel there too. There are four D-trains running from Pingyao Gucheng to Xi’an North daily. It costs 150 RMB for a second class seat and 187.5 RMB for a first class seat. 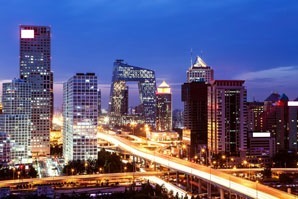 The G-train and two D-trains will take you directly to Beijing West Railway Station. The G-train is 225.5 RMB for a second class seat and 322.5 RMB for a first class seat. The D-trains are much cheaper, ranging from 183 RMB for a second class seat to 254.5 RMB for a first class seat. Train classes: G Trains — the fastest trains with a speed of over 300 kph. Ticket prices are higher. D trains — slower and cheaper than G-Trains and more widely used. D trains are designed with a speed of over 200 kph (124 mph). This type of train is mainly used on the popular rail lines connecting major cities. 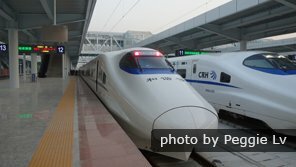 Faster bullet train between Beijing and Xi&apos;an: Be aware that there is a direct Beijing to Xi&apos;an bullet train for going directly between Beijing and Xi&apos;an. So you have a choice of various routes and sightseeing along the way. Conventional trains: This is another travel option from the Pingyao Railway Station. Many tourists like the relaxed travel since you can sleep in bed bunks instead of hotels and it is inexpensive. 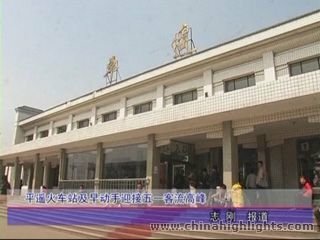 The regular train station affords about the cheapest way to travel in China. Check-in time: Please allow sufficient time to perform the departure procedures and check your baggage. Be alert and be on the platform when the train arrives. Safety: Keep your luggage and baggage closed and close to you. Luggage portage: Ask the help and information desk staff if you need help getting your luggage on board or for other help. See How to Get On/Off a Train and 7 Things to Know Before Riding a Train for more. Since there are two train stations in Pingyao, be clear about which station you want to use. Drivers might take you to the wrong one. When you buy a ticket, make sure it leaves from the station you want to leave from. Check the name carefully. Taxis aren&apos;t allowed in the Ancient City, so taxis can only go to/from the entrances. More than a hundred taxis are available. Some wait in front of the station for tourists. Safety: Be aware that some drivers or people in fake taxis might scam you by overcharging or giving counterfeit money. Make sure that they turn on the meter, or they may charge much higher. Day fare: 6 RMB for the first 3 km (1.9 miles) and then 1 RMB per each additional kilometer. Night fare: 9 RMB for the first 3 km (1.9 miles) and 1.5 RMB per each additional kilometer. To the Ancient City: The cab fare to the Old City (South Gate) is about 30 RMB during the day. Higher at night. Half an hour. You&apos;ll find a variety of transportation available such as bicycles, electric bicycles, and motorcycle taxis, and a wide range of prices. Haggle before you get on. You can rent bikes at the North Gate and at many hostels. Walking: You could walk to Fengyi Gate — the entrance of the ancient city. This is not recommended if you do not know the way. If you are not in a hurry or want a cheaper journey, you can take Bus 103 from Pingyao Railway Station and then take a taxi to the entrance of Pingyao Ancient City. The station is served by Bus 103 every 15 minutes. Bus 108 goes to the Ancient City too. You could book tickets in either station in Pingyao. Or book tickets with us. In 2015, we helped over 10,000 customers get their tickets and facilitated their trip in China. We are available 24/7 and will have your train tickets delivered by express mail to your appointed address or hotel. See our Xi&apos;an, Pinyao, and Beijing train tour suggestions. We can arrange your tickets and facilitate your tour in the area. We can also arrange for a driver so you can see the area in a relaxed comfortable manner. 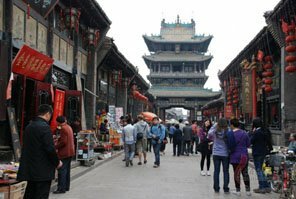 You may also be interested in our recommended 2-day Pingyao itinerary, which can be combined with a tour of other China cities.